Neha Bhasin (born 18 November 1982) is an Indian professional singer known for her works in Indian pop, and Bollywood. Apart from Hindi, she has recorded songs in many Indian languages including Telugu, Tamil, Punjabi and Marathi. Neha started her career in 2002 as a member of the very successful Indian pop group Viva. VIVA was the first all-girls band group of India chosen by Channel [V] as part of reality show Coke [V] Popstars and along with Neha other band members were Anushka Manchanda, Pratichee Mohapatra, Mahua Kamat and Seema Ramchandani. Viva made an entry into the Limca Book of Records for being the 1st debut band to pull in over 50,000 people for their first concert. 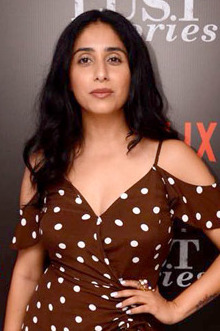 After the success of two albums – Viva and Viva Reloaded and 8 videos, the band split in 2004.. She was a judge at Love Me India music reality show. Neha Bhasin was born in Delhi to Ashok Bhasin and Rekha Bhasin. She went to Kendriya vidyalay R K Puram sector 2 followed by Frank Anthony Public School and won her first singing competition singing Mariah Carey's song Hero at the age of 9. Ever since she was a child she was sure that she wanted to become a popstar. To put her dreams into reality she joined Shiamak Davar's dance academy to learn various dance forms. She also took vocal classical training from Ustad Ghulam Mustafa Khan. Neha Bhasin married Sameer Uddin, a music composer, in a western wedding in Tuscany, Italy on October 23, 2016. Neha was attending Lady Sri Ram College when she auditioned for Coke [V] Popstars in 2001 and won the competition to form India's first all girls Viva (band) along with four other girls. Kuch Khaas Hai from the movie Fashion topped the charts when it got released in 2008 and still is one of the top romantic songs. Dhunki from the movie Mere Brother Ki Dulhan starring Katrina Kaif won many awards. Poraney Poraney crooned by Neha Bhasin for the movie Vaagai Sooda Vaa received a lot of appreciation from the audience. Aww Tuzo Mogh Kortha (2014) which had music by Devi Sri Prasad became the biggest Telugu hit of the year. Neha collaborated with Malaysian Hip Hop star Emcee Jesz for the song "THANIYE". The song has over 300,000 views on YouTube alone. It was also nominated for "Best Collaboration" at the RADIO RAGA AWARDS in Malaysia (2008–09). Neha charmed Bollywood, making her acting debut starring in the film Life Ki Toh Lag Gayi, a Kay Sera Sera production. She starred alongside Kay Kay Menon and Ranvir Shorey in the movie which released in 2012. Neha played the role of Anchor and Judge on musical reality show Sitaaron Ko Choona Hai that aired on Real TV. Neha was a wildcard entry on Jhalak Dikhla Jaa Season 5. Neha established her childhood dream with the release of her debut album Tabaah with Beatfactory music, an independent label. International sports brand Reebok collaborated with Neha Bhasin for the launch of the fast-paced, groovy number Apple Bottoms. The music video garnered 650,000 views on YouTube alone and 100,000 views on timesofindia.com in just 1 week of its release. Apple Bottoms was nominated at Indian Music Academy Awards 2011 in the category of "Best Non-Film Track of the Year". Tera Mera was released in July 2012 as a single, with a Black and White video. It is written by Neha Bhasin, music by Sameer Uddin and promoted and released by Reliance Big Entertainment. It received more than 300,000 views within 30 days of its release. Neha released an unplugged version of Tera Mera on Valentine's Day 2013. It was a coloured version and she spreads her love for all her fans through the special song. Latthe Di Chadar Digitally powered by One Digital Entertainment and composed by Sameer Uddin, Neha released her first Punjabi folk song Latthe Di Chadar in 2014 and received great reviews. Bajre Da Sita Directed, produced and composed by Sameer Uddin, Neha released her next Punjabi Folk Song Bajre Da Sita in January 2015. The video was produced by Imaginary Friend Films and 5 am Audio. Main Tenu Samjhawan Ki In Feb 2015, Neha Bhasin released her cover version of the very popular Punjabi song Main Tenu Samjhawan Ki. A trip to Vietnam inspired Neha to perform a cover of this song in the lush green fields at Vietnam. Kuch Khaas Hai Unplugged On 30 April 2015, Neha Bhasin released the unplugged version of her own song Kuch Khaas Hai from the movie Fashion. This song was featured on Priyanka Chopra and Arjan Bajwa. It was originally composed by Salim-Sulaiman and sung by Neha and Mohit Chauhan. Aansu Bhari Hai On 12 June 2015, Neha Bhasin released her rendition of song Aansu Bhari Hai from the movie Parvarish. This song was originally sung by Mukesh and picturised on Raj Kapoor. The song was rearranged by Sameer Uddin. Akh Kashni On 18 August 2015, Neha Bhasin released Akh Kashni on her official verified Facebook page NehaBhasin4u, another addition to her Punjabi folk project. Two days later on 20 August 2015 Akh Kashni was released on YouTube. Akh Kashni is an old folk song often sung at Punjabi Weddings. The music is produced by Sameer Uddin and music video is directed by Piyush Ragani. Shudai Composed and sung by Neha Bhasin, Shudai released one day prior to Valentine's day on 13 February 2017 on her official YouTube channel NehaBhasin and MTV India. This was part of MTV Spoken Word 2 which features the hottest Indian artists creating music for the audience. The lyrics are penned by Neha Bhasin herself along with her mother Rekha Bhasin. The music is produced by Sameer Uddin and music video is directed by Prayrit Seth. The music video features actor, model and MTV Splitsvilla Season 1 winner Vishal Karwal. It also featured rapper Raxstar. A trained dancer and singer, Neha is an active performer traveling nationally and internationally. Neha performed in the presence of the president of Singapore inaugurating the first Tamil channel in Singapore in 2008. Neha performed a daring aerial Act at the Radio Mirchi Awards 2011, with her rendition of her chart-buster Kuch Khaas Hai. Neha performed alongside Salim and Sulaiman in 2010 Global Music Awards. Neha supports CPAA (Cancer Patients Aid Association) and has performed live at CPAA. Neha has performed for brands like Google, Cadbury, ICICI, MRF, TVS, Kingfisher, Johnson & Johnson, Domino's, Samsung and annual meets of top corporates like Infosys in the country. Neha has also performed at IIM Lucknow, IIM Ahmedabad, XIMB Bhubaneshwar, BVRIT Narsapur, GCIET Hyderabad and many prestigious colleges in the country. Neha performed at Airtel Super Singer Grand Finale. Neha performed at YouTube Fanfest Delhi 2018. ^ "Neha Bhasin on Raag.fm". music.raag.fm. Retrieved 3 April 2015. ^ "Neha Bhasin profile on bollywoodmdb". bollywoodmdb.com/. Retrieved 3 April 2015. ^ "Viva Splits". mouthshut.com/. Retrieved 3 April 2015. ^ "Neha Bhasin on Saavn". Saavn. Retrieved 3 April 2015. ^ "VIVA biography". planetradiocity.com/. Retrieved 3 April 2015. ^ "Seema leaves Viva for Art of Living". timesofindia.indiatimes.com. Retrieved 3 April 2015. ^ "Neha Bhasin turns nutritionist for her co-judges on a reality show". Times of India. 28 September 2018. ^ Natasha Chopra (12 January 2005). "Vivacious". Ahmedabad Times. p. 21. Retrieved 3 April 2015. ^ "Neha Bhasin". beatfactorymusic.com. Retrieved 3 April 2015. ^ "Neha Bhasin is not really bothered about the 'sad reality' of male singers dominating Bollywood". Hindustan Times. 19 March 2018. ^ "54th Filmfare Awards 2008 Nominations". glamsham.com. ^ "10 years of Max Stardust Awards". mxmindia.com. Retrieved 3 April 2015. ^ "Gama Film Music Awards returns to Dubai". gulfnews.com. Retrieved 3 April 2015. ^ "Stardust Awards 2016 Winners". www.bollywoodhungama.com. ^ "Fashion – Music Review". bollywood.com. ^ "Mere Brother Ki Dulhan – Music Review". glamsham.com. ^ "Neha Bhasin strengthens foothold in regional music market". radioandmusic.com. ^ "Chinmayi happy about award". timesofindia.indiatimes.com. ^ "Mahesh Babu's 1 Nenokkadine audio review". timesofindia.indiatimes.com. Retrieved 3 April 2015. ^ "Neha Bhasin endorses Sennheiser". businessofcinema.com. Retrieved 3 April 2015. ^ "Key factors for Sennheiser's success in India". Sennheiser. Retrieved 4 May 2015. ^ "Life Ki Toh Lag Gayi Credits". Internet Movie Database. ^ "Neha Bhasin hosts Sa Re Ga Ma Pa Hungama on Zee Music". indiatoday.intoday.in. ^ "Song sung true". thehindu.com. ^ "Sitaron Ko Choona Hai". ^ "Neha Bhasin Wild Card on Jhalak Dikhla Jaa". bollywoodhungama.com. Retrieved 4 April 2015. ^ "Neha Bhasin's Apple Bottoms". timesofindia.indiatimes.com. Retrieved 4 April 2015. ^ "2011 IMA Award Track of year". Retrieved 4 April 2015. ^ "Neha Bhasin's Tera Mera Unplugged". YouTube. ^ "Latthe Di Chadar at MTV Indies". ^ "Bajre Da Sita on MTVIndies". pepsimtvindies.com. Retrieved 4 April 2015. ^ "Kuch Khaas Hai". www.youtube.com. ^ "Aansu Bhari Hai". Youtube. ^ "Akh Kashni". Facebook. NehaBhasin4u. ^ "Neha Bhasin Live at Singapore". ^ "Aerial Act – Kuch Khaas Hai". YouTube. Retrieved 4 April 2015. ^ "Salim Sulaiman feat. Sonu Nigam & Neha Bhasin | 2010". ^ "Neha Bhasin Performing Live for CPAA". Retrieved 4 April 2015. ^ "Neha Bhasin Live at Google Family Day". ^ "Neha Bhasin Live at Infosys Hyderabad". ^ "Kabira by Neha Bhasin at GCIET Hyderabad". ^ "Apple Bottoms Live at GRIET". ^ "Airtel Super Singer Finale". Wikimedia Commons has media related to Neha Bhasin.